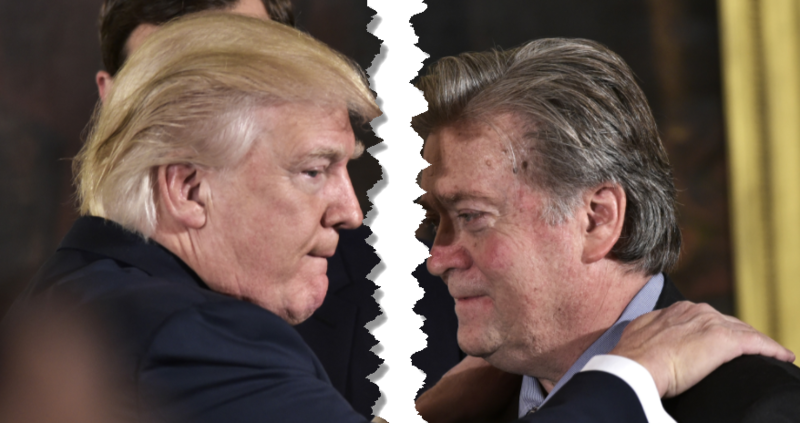 Furious Trump Responds To "Pretender" Bannon: "He Has Lost His Mind"
Following Steve Bannon's earlier remarks from a forthcoming book about "treasonous" meetings at Trump Tower, President Trump lashed out and denounced his former top strategist, Steve Bannon, on Wednesday, saying that he “lost his mind” after leaving the White House last summer. "When he was fired, he not only lost his job, he lost his mind," Trump blasted Bannon in a White House statement. "Now that he is on his own, Steve is learning that winning isn’t as easy as I make it look." In the bizarre, 265-word statement, Trump indicted Bannon for some of his activities at the White House and afterward. He blamed him for the loss of a Republican Senate seat in Alabama in a special election last month and accused him of leaking to news reporters while he served as the White House chief strategist. "Steve had very little to do with our historic victory, which was delivered by the forgotten men and women of this country,” Trump fumed. "Yet Steve had everything to do with the loss of a Senate seat in Alabama held for more than thirty years by Republicans. Steve doesn’t represent my base -- he’s only in it for himself." As Bloomberg notes, the statement represents a dramatic and emphatic break from the person considered the architect of Trump’s presidential campaign. Bannon continued to enjoy access to the president after he left the White House, but that has now ended, according to Bloomberg. Earlier on Wednesday, New York Magazine published excerpts of a forthcoming book by author Michael Wolff in which Bannon criticizes Trump’s campaign as well as the president and his family. The Guardian published excerpts of the book in which Bannon predicts that Special Counsel Robert Mueller will “crack Don Junior like an egg on national TV” over the president’s son’s meeting with a Russian lawyer at Trump Tower in June 2016. Bannon also called Donald Trump Jr.’s meeting with the lawyer, in which he expected to receive damaging information on Trump’s election opponent Hillary Clinton, “treasonous” and “unpatriotic,” according to the Guardian. Steve was a staffer who worked for me after I had already won the nomination by defeating seventeen candidates, often described as the most talented field ever assembled in the Republican party. Now that he is on his own, Steve is learning that winning isn't as easy as I make it look. Steve had very little to do with our historic victory, which was delivered by the forgotten men and women of this country. Yet Steve had everything to do with the loss of a Senate seat in Alabama held for more than thirty years by Republicans. And so much for "having more power" to fight the resistance from outside The White House.